Evelyn Escuella, otherwise known as The Vicar, is a coyote born in the region between Nevada and Utah known to locals as Rattler's Gulch. Born as the local Preacher's daughter, she and her brothers, Calhoun Escuella and Lawrence Escuella lived a modest life in their youth, despite their father's penchant for gambling regularly tracking trouble back home. Evelyn picked up her father's charisma early on, and often played devil's advocate and, on more than one occassion, used her speechcraft to talk her and her family out of any trouble they got up to. 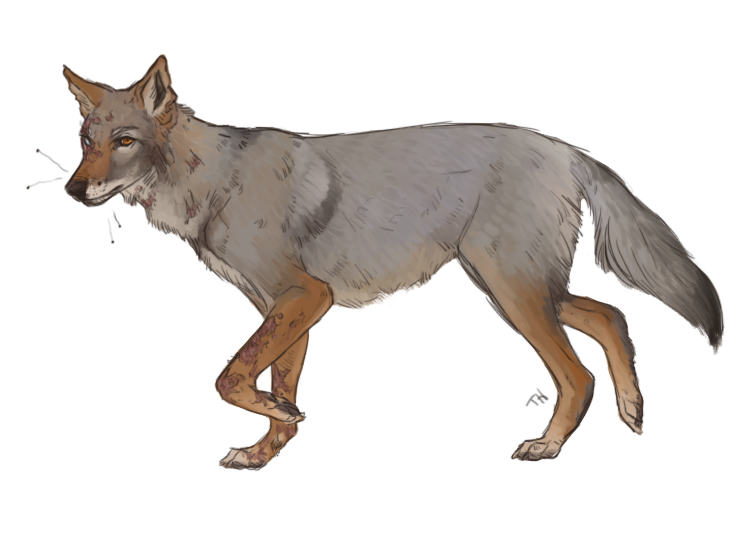 The trio of siblings helped to support their parents' ranch until a band of wolves, the Deadcreek Revivalists, swept through the region and razed the coyote settlements to the ground. The Escuella Estate was reduced to rubble, and Evelyn was trapped inside, suffering injury; a falling support beam permanently marred her arms, and the right side of her face, partially blinding her. Her brothers aided in rescuing her, though Lawrence succumbed to his injuries shortly after. With their home destroyed, and family gone, Evelyn and Calhoun scattered into the desert, where they ran into a fellow neighbor, and friend, Santiago Tejada, the trio in bad shape, but alive. After wandering the desert, the trio were found, and picked up, by a modest gang of coyote outlaws known as the Drygrass Posse, where they were cared for and nursed back to health, only to join up in their ranks. After run-ins with rival wolf gangs, and self-proclaimed regional law, the Posse fled north to escape their hunting, until only the trio from Rattler's Gulch remained. I've been traveling on this land where my feet don't understand, The red rising ripples of the sea, and In this place I call home the sky is Always painted gold with the help of a brush and a sycamore tree. Maybe you'd like to adopt her brother, The Reverend, Calhoun Escuella?? Hearing about local livestock thievery/moonshining operations lead by a band of coyotes. Thin, waifish and unassuming in build, and very obviously coyote. She has a slim, tapering muzzle, and wilting, long fingers, with large, though deeply apathetic eyes. Ears are rough and ratty, though the scars are tough. The right side of her face is covered in scarring, and the hair grows in patchy and uneven, if at all. Her hair does not grow evenly from her injuries - and she typically keeps it short cropped, or at the very least attempts an extreme asymmetric style; not that it's often seen, beneath her almost ever-present hood. 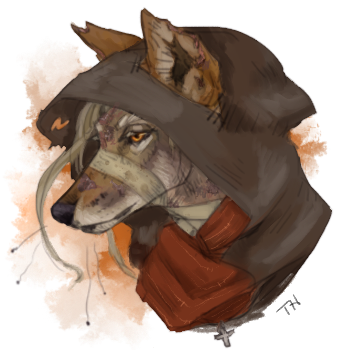 Her scars are sensitive to sun exposure and fire-side heat, and as such, she keeps well bundled up for her own comfort. Markings: Cod Gray points at the shoulders and tail-tip, and hocks. Potters Clay legs, ears. Potters Clay snip on muzzle, lined by Masala, with Masala cheeks. Muesli inner legs, and face. Mongoose toes. Eyes: Tuscany. The right eye is blind, and fully Catskill White.